Discus provides some of the most advanced, wide-ranging personality profile reports available anywhere, with each report completely tailored to the specifics of a person's profile. The unique advantage of a Discus report is the way that its content is put together. 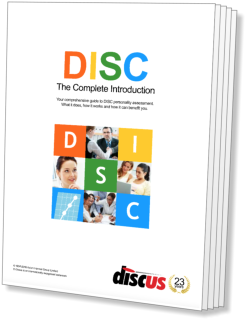 While many DISC reports simply break down profiles into a handful of types, Discus is different: it includes a powerful reporting system that can describes a person's profile in detail, using plain language to cover numerous different business topics. Reports are available at various levels to suit your needs, with the top-level Enhanced report running to some eighty pages or more, depending on the details of a profile. Discus offers a whole range of other reporting features, too, including the option to add your own branding to a report. Complete biographical information from your Discus database in the Cloud. A full breakdown of all the candidate's basic DISC factors across multiple profiles. Quick graphical overviews of behaviour in common situations. You can view Discus DISC reports directly through your browser with just one click, or you can recreate them in high-quality PDF format. That makes it easy to make printed copies, or to e-mail a report for review by others (and Discus actually has built-in report e-mailing facilities to make this even easier). You also have the option to customise the report, focusing on just those topic that are directly relevant to you. The Discus personality report is filled with information across different subjects. Here we'll take a look at some of the highlights, but be sure to take a look at the full report contents on this page and see how a complete report fits together by viewing a sample report. Key personal traits, current or potential, at your fingertips. An overview of possible pressure effects and potential stress. Up to twenty-one sections of clear textual analysis written in natural language. As you'd expect of a DISC profile report, we start with the DISC profiles themselves. We do more than just show the profiles, but give a breakdown of each factor in each profile, explaining how it contributes to a person's overall behaviour and working style. There's plenty more graphical content, too, including Style Cards that summarise a person's behaviour in contexts like leading and learning, a Trait Grid showing how a person's approach might change over time, and a Profile Tension section to looking at potential sources of stress. At the heart of a set of Discus DISC results is the Textual Report, explaining a personality in terms of up to twenty-one different business topics. An overview of the ways the candidate interacts with other personality types. Compare a candidate against the personality needs of any role. A useful reference guide to the most common DISC profile shapes and their meanings. A complete and comprehensive reference to guide, customised for each candidate. Each part of the Textual Report is crafted from a database of commentary that's matched to the exact details of a personality style, which can combine in literally millions of different possible ways. The report covers broad topics such as motivation and decision making, as well as performance in specific types of roles such as management or sales. Also included is a set of behavioural questions, so the DISC report can help you to design a customised interview. There's more to the Discus report, too, including a look at the ways a person is likely to relate to others, and a full appendix covering any technical terms used in the main report. You can also add an optional Job Match, tying the report in to a particular role, and rating the personality against the needs of that job. Choose any of your candidates, and Discus will display a complete DISC report in your browser right away. From here, you can adjust the report's contents, and create a full PDF copy ready to share. Comprehensive as the main personality report is, Discus has even more to offer. Additional personality reports are also available to give you even more options and analysis. These additional reports are automatically available free for all Enhanced Discus reports, but you can also choose to make them available for other report types. Discus Report Contents: Each Discus report can cover all of these topics, though you can choose which appear in any individual report. The Textual Report: The Discus Textual Report can cover all of these subject areas (though note that some of these are only available in a full Enhanced report). See a Sample Report: You can see how all these features and topics fit together to create a full set of DISC results in a complete sample Discus report.